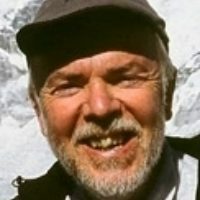 Stephen Goodwin is a freelance journalist and editor of the prestigious Alpine Journal, the oldest mountaineering journal in the world. In 1999, after 25 years as a staff journalist on The Times and then The Independent, he exchanged the turbulence of Fleet Street and politics in ‘the Westminster village’ for the subtler currents of Cumbria’s Eden Valley. When not tempted from his desk by the crags of the nearby Lake District, most days are devoted to the AJ, which he has edited since 2004, and writing about mountain matters, the environment and just a dash of politics. A climber and ski-mountaineer, he got his first taste of the Himalaya in 1998, on a dream assignment, and reached the south summit of Everest, filing an award-winning diary to The Independent. Since then he has returned to the Himalaya most years as well as climbing, trekking and ski-touring in the Alps, Andes and Turkey. Happy sharing his enthusiasms with others, he enjoys leading trekking and climbing groups for Mountain Kingdoms. In 2009 he published a guide to Day Walks in the Lake District (Vertebrate), and has recently edited books by climbers Ron Fawcett and Simon Yates.